My School reports never said "easily distracted" but now, at this age and time in my life I am! For some time now I have know that I want to make a rainbow quilt of some sort. There are so many types out there and I quite often find myself surfing the Internet looking at images of Rainbow quilts. I knew that some time in the future I would. But now this desire to make a rainbow quilt is in my head again and is beginning to hurt, so I have to do something to "let it out" and release the pressure! Then some time last week I read a post over at sewmamasew. They are hosting a contest, it involves writing a tutorial etc. I have no interest in participating in the contest (I don't think I could write a tutorial, I'm just not that clever!) but it did get me to thinking about my slowly growing scrap piles. So you know where I am going now? 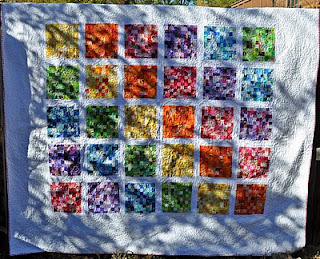 Yep a Rainbow Quilt made from Scraps. 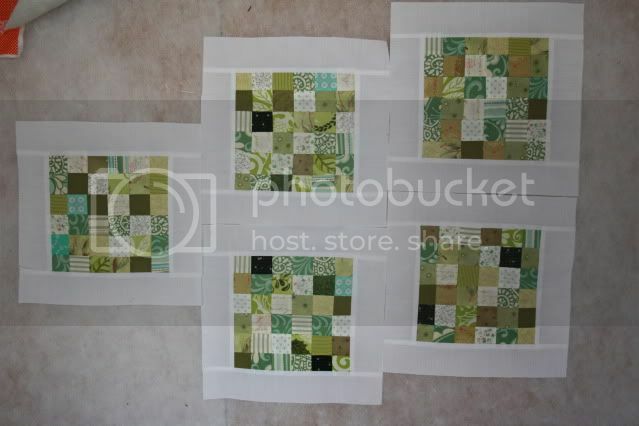 After looking at many, many, many photos here is the design inspiration for my quilt. the credit that they deserve. This will be a long term project for me as my scraps allow. 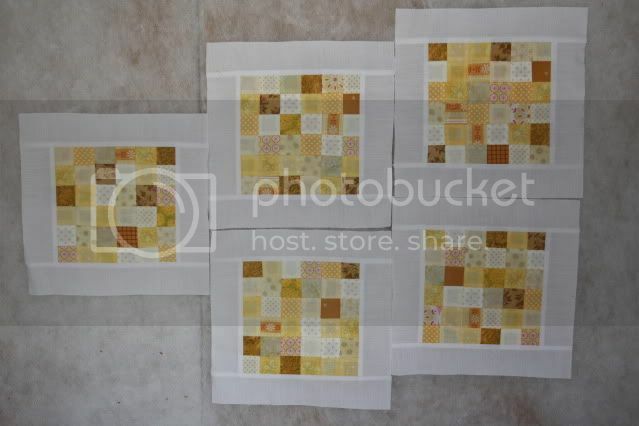 I also find that every now and then I need a sewing fix and I am thinking that these blocks will be my sewing fix. I just seem to have so many hand stitching / embroidery projects happening at the moment so this will be a welcome change for me. "Hello, my name is Sharon and I am a quilter!" I have decided to do my blocks in a grid of 6x6 (36 squares per block) and 5 blocks of each, therefor I need at least 180 blocks of every color. So I started with the fullest of my scrap boxes, Yellow, Green and Pink. So far Yellow and green are sewn and not long before I have enough Pink squares to start sewing them. Your new quilt is looking beautiful already, what a lovely idea. I'm looking forward to seeing the other colours as you make them. 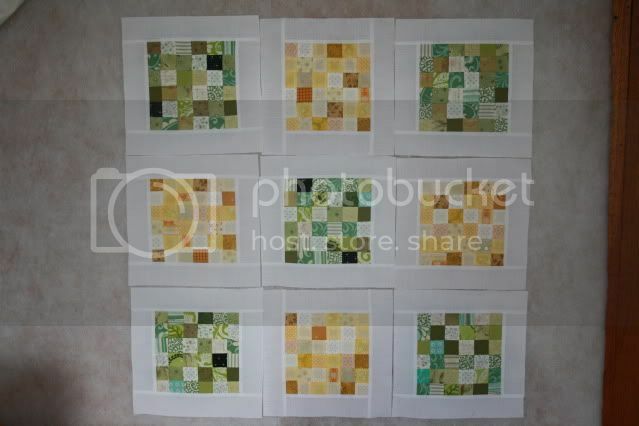 wow I love the look of that postage stamp quilt, fantastic work! can't wait to see more!